Heat the oven to 375°F. Lightly grease 2 baking sheets. Unfold the pastry sheet on a lightly floured surface. Roll the pastry sheet into a 9x12-inch rectangle. Cut into 24 (1 1/2 x 3-inch) rectangles. Place the pastries onto the baking sheets. Brush the pastries with the egg and sprinkle with the sugar. Bake for 10 minutes or until the pastries are golden brown. Remove the pastries from the baking sheets and let cool on wire racks for 10 minutes. Split each pastry into 2 layers, making 48 in all. Place the lemon curd into a medium bowl. Fold in 1 1/2 cups whipped topping. Spread about 1 tablespoon lemon curd mixture on each bottom layer. 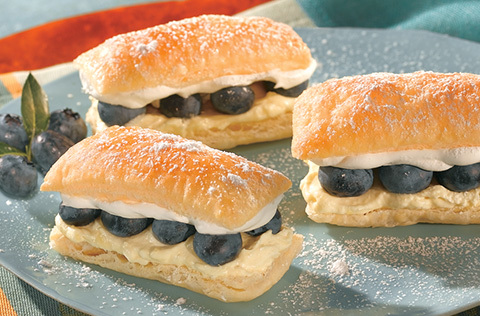 Top each with about 1 tablespoon blueberries, about 1 tablespoon remaining whipped topping and a top layer. Ingredient Note: For 3 cups sweetened whipped cream, beat 1 1/2 cups heavy cream, 3 tablespoons sugar and 1/2 teaspoon vanilla extract in a medium bowl with an electric mixer on high speed until stiff peaks form.